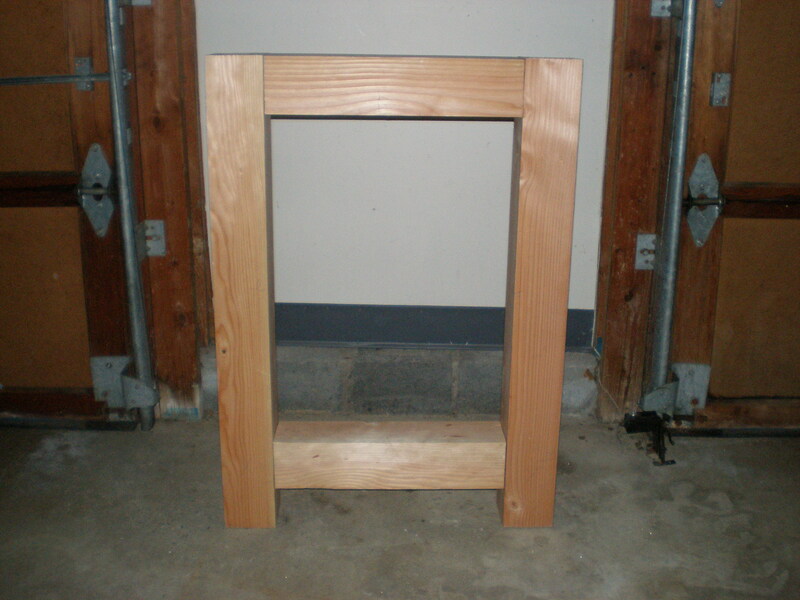 The lumber (doug fir) for the legs has been in the shop for a while now, and seems to have acclimated. I began by cutting the legs and cross pieces for the two side assemblies. The lumber is construction grade so I had to do a little work to square up some of the factory cut ends. Next I began planing references faces on the legs and cross pieces for one of the assemblies. I decided to work on them individually to break the work down so it would be more manageable…something I really like about hand tools. I marked out all four mortices and tenons using a marking gauge and knife. I made sure to carefully mark off the waste sections, as a the two tenons on the bottom are off set to allow room for the mortise and tenon of the front and back stretchers. 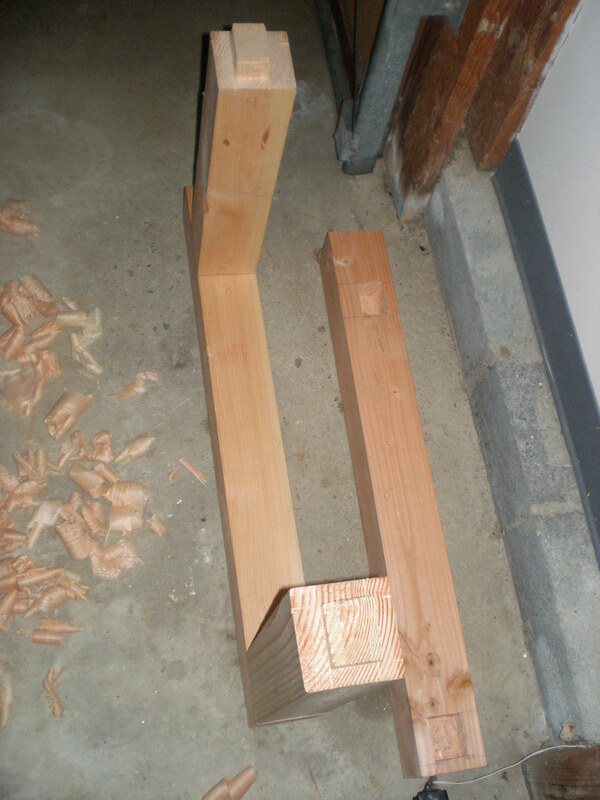 I cut all the tenons using my new Lie Nielsen 12″ tenon saw. If you haven’t already, you can read my brief review here. I made sure to deepen the knife and marking gau ge line with a chisel to create a reference for the saw to follow. Then I broke out my new Lie Nielsen x-cut carcass saw to saw the shoulders of the tenons. You can read my review of this puppy here. 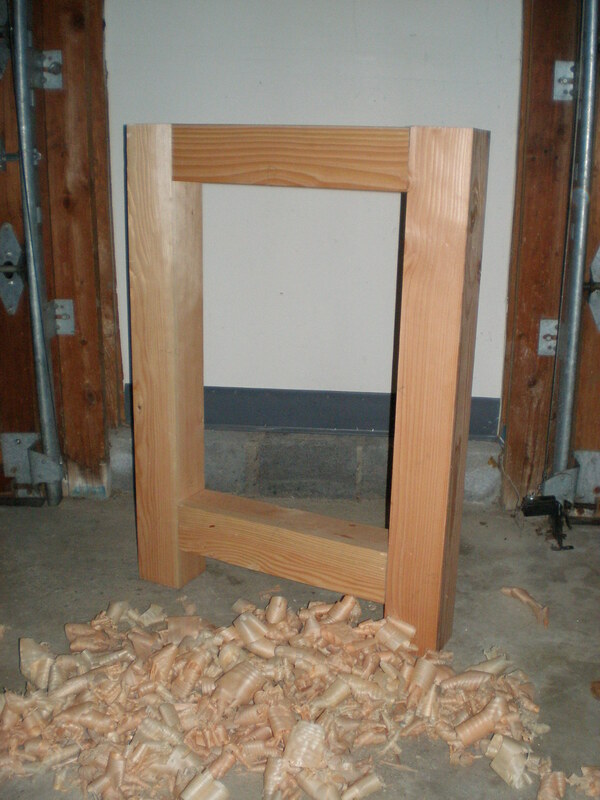 That was all the work I had to do on the tenons…they came quite square off the cut…not perfect, but well enough for my workbench. By the way…yes that is blood on the side of the cross brace in the picture to the right of the offset tenon…I put everthing into my work. 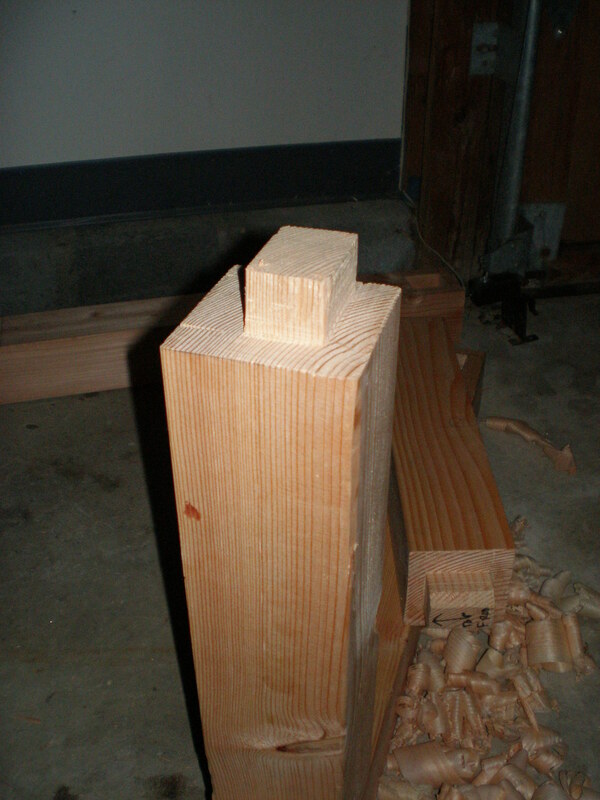 I then showed each tenon to each mortise that I had marked out previously. I had them all numbered so as to easily find their mates. I had to make some slight adjustments to the mortises scribe lines, which I did before deepening them with a chisel. 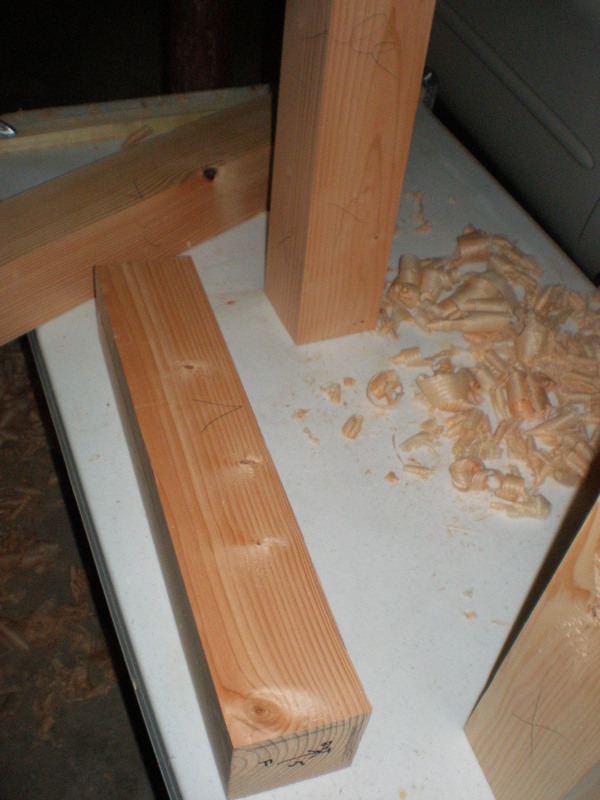 I cut the mortises by first using a 1″ diameter forstener bit to hog out most of the waste. Then I came in with a couple of chisels to fine tune the mortise walls. After a few test fits and fine tuning on each one, the first assembly went together good. I checked for square and it was dead on. I plan on gluing and drawboring the joints, but not for now. I want to use the cross braces as references pieces for the corresponding cross braces on the other side assembly. Once the second side is finished, I will glue and drawbore them both. I then started on the second side assembly, and so far have only got as far as planing t wo reference faces on each leg and cross brace. 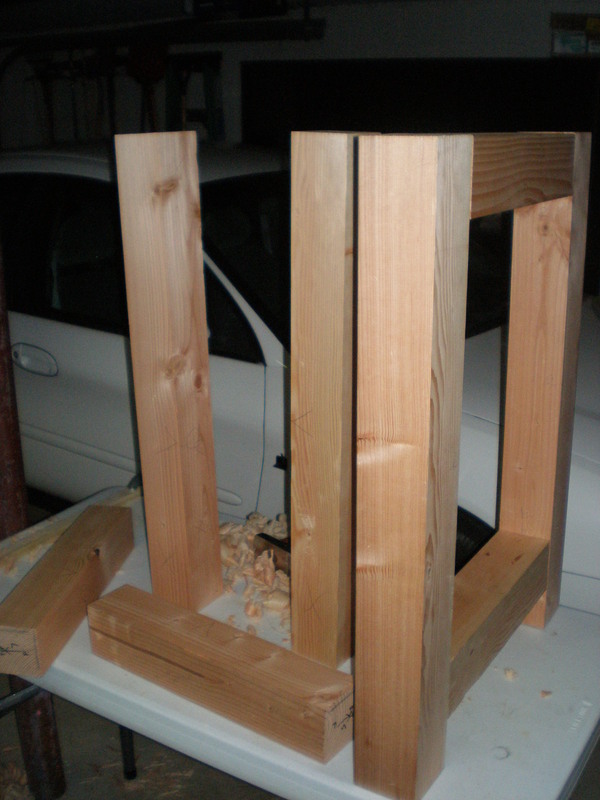 Tonight I plan on marking out all the mortise and tenons, and then sawing out the tenons the next night or so. It seems like it has been a slow process thus far, but I am making sure to do this to my satisfaction because this will be my most used tool in the shop.